October was a funny old month for Millwall fans. Two defeats, one draw and a fine win over Birmingham City left them lower down the table than their performances probably deserved. However, the general feeling around the ground was that victory over struggling Burton Albion would set them up nicely for November. This is Millwall though. Lack of real creativity in front of goal and a harsh decision by the referee ensured misery for the home fans, and allowed Burton Albion to climb out of the relegation zone. Meanwhile, in the executive lounge there was not a meat pie in site. The wine flowed like, well, wine, and the dessert looked good enough to post on Instagram (although I didn’t!) 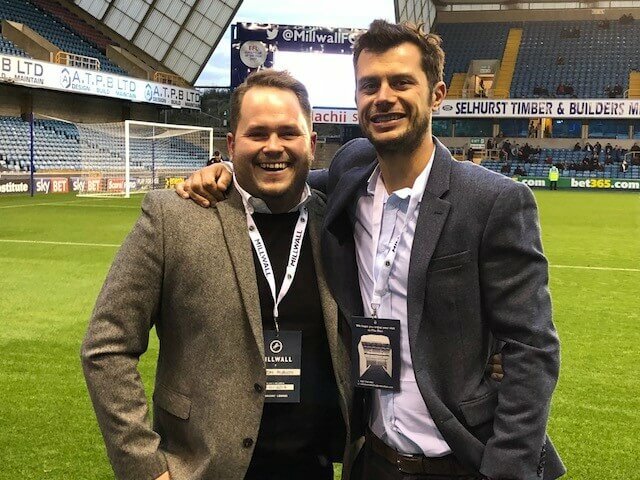 EnergyBet were joined for the game by two long standing Millwall fans who had earned a seat at the EnergyBet table simply by re-tweeting one of our Twitter posts (yes, it really is that easy folks!) Before the game these lads were full of optimism and predicted a 2-1 win for the Lions. After the game, they were largely full of Kronenbourg, and opining an excellent opportunity missed. EnergyBet Twitter competition winners revelling in the atmosphere at the Den. At half time and with the score still at 0-0 EnergyBet were allowed onto the pitch to conduct a X-bar challenge competition with two more Twitter competition winners (Twitter seems to be the place to be). Unfortunately, nobody managed to hit the X-bar (although they did hit the back of the net several times. Were you watching Neil Harris?) 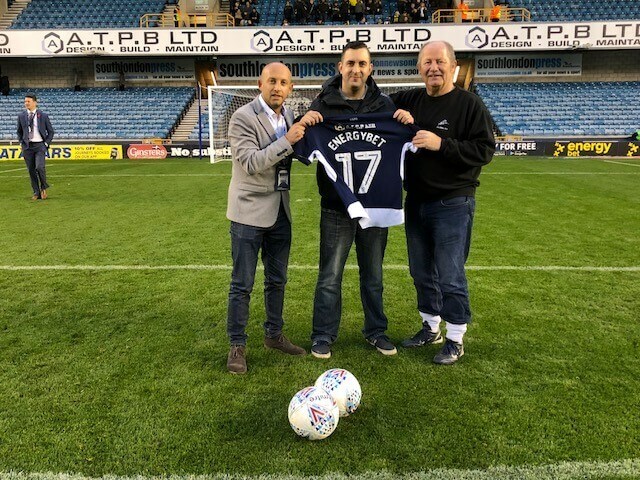 Closest to doing so though, and adjudged to be the winner of a signed Millwall home shirt was the exceedingly talented, Ricky. Well done Ricky! EnergyBet representative, Russell Yershon with X-bar challengers, Ricky and Ted. Would you like to enjoy a match day experience courtesy of EnergyBet? Follow our Twitter feed and get re-tweeting!